CLEVELAND – The City of Cleveland has completed plowing all 8,000 residential side streets and continues snow removal operations in residential side streets. The snow emergency parking ban is in effect until 7 a.m. Tuesday, Jan. 22nd. Please allow plows sufficient time and room to continue to clear streets. “This storm was a very fast-moving storm and it was a little bit challenging because the wind picked up speed causing snow drifts,” said Shelton Coleman, Assistant Commissioner with the Division of Streets. “There were areas where cars were stuck and that impeded some of our equipment from getting through to finish up and open the roadways as fast as they could have.” Click here to view the rest of Coleman’s remarks on our Facebook page. Please keep in mind that continual falling and drifting snow – which occurred with Winter Storm Harper – presents an extra challenge for keeping roads clear. The City requests that, if possible, you please park your vehicle in your driveway and keep the streets clear as snow removal operations continue in residential streets. 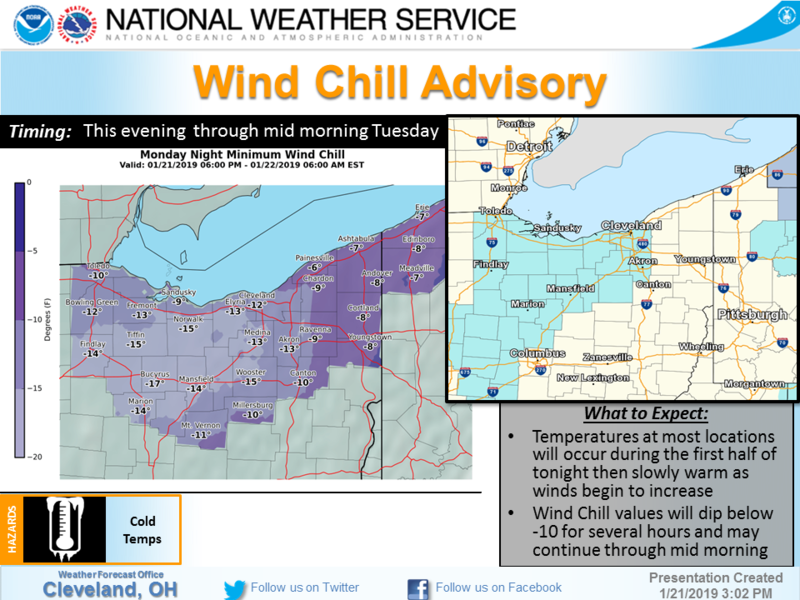 Temperatures in Northeast Ohio will be in the single digits and wind chills overnight will reach as low as -17 degrees. Emergency parking ban will be in effect until 7 a.m. Tuesday, Jan. 22nd. Click here to view the streets affected by the ban. The City currently has 48 trucks, 7 road graders and 12 pick-ups deployed on residential side streets, and all plows and pickups are loaded with salt. The City has more than 10,000 tons of salt. “As we make our continuing service efforts, our goal will be to further clean up roads by Tuesday morning rush hour for a safe commute for our residents and others traveling,” said Darnell Brown, Chief Operating Officer. Find equipment and snow removal timeline listed here and the NWS wind chill update here. The City will provide updates as they are available. Follow us on Facebook at Facebook.com/CityofCleveland for updates. Cleveland Public Power has no reported power outages. However, if you experience a power related issues call 216-664-3156. Cleveland Water is aware of multiple water main breaks and crews are working around the clock to make repairs as quickly as possible. If you experience a water related emergency you should call 216-664-3060. The City of Cleveland is committed to improving quality of life its residents by strengthening neighborhoods, delivering superior services, embracing diversity and making Cleveland a desirable, safe city in which to live, work and play. For more information on the City of Cleveland, visit online at www.city.cleveland.oh.us, Twitter at @CityofCleveland or Facebook at www.facebook.com/cityofcleveland.